Obviously, the work of an organization is carried out by its representatives. But is trust built between the people themselves? Is it based on their personal qualities, their professional credentials or their position in the organization? And, if trust is placed in the individual, does it disappear with turnover or is it automatically extended to a successor? The question we tackle today is where does the trust lie in inter-organizational relations? It’s a HUGE question (and a long post) but an important one for organizations to tackle because of significant investments in different types of trust-building. What if you’re investing a lot of time and effort in building personal relationships but really, professional interactions or governance mechanisms matter more to your partner? Shouldn’t you know? Shouldn’t you shift your focus to maximize your outcomes? The answer is, inter-personal and inter-organizational trust are seperate and distinct constructs but still inextricably linked because the work of an organization is carried out by individuals who cannot help but like, assess, trust or distrust one another. However, and it’s a BIG HOWEVER, trust is placed in the individual as an agent of the organization . You might be a very capable, benevolent person but you have to have the position and power to deliver in a business relationship – AND in the organization itself. Conversely, if your organization has horrible ambassadors, they will reflect negatively on the organization itself and the trust will never transfer to the individual and then to the organization. When you go to the bank, do you trust the teller or the bank, their brand, the deposit insurance? Do you even talk to a person or do you trust the technology of an instant teller? All of the above? Now extend the question to inter-organizational partnerships and alliances. 1. Does inter-personal trust matter in inter-organizational relations (IORs)? For once, the answer is an unqualified YES! Transfers from an individual to an organization (Week 2). When a partner trusts a salesperson or a representative of an organization, they also extend that trust to the person’s organization (Doney & Cannon, 1997; Ganesan, 1994; Hexmoor et al., 2006; Jap, 1999). 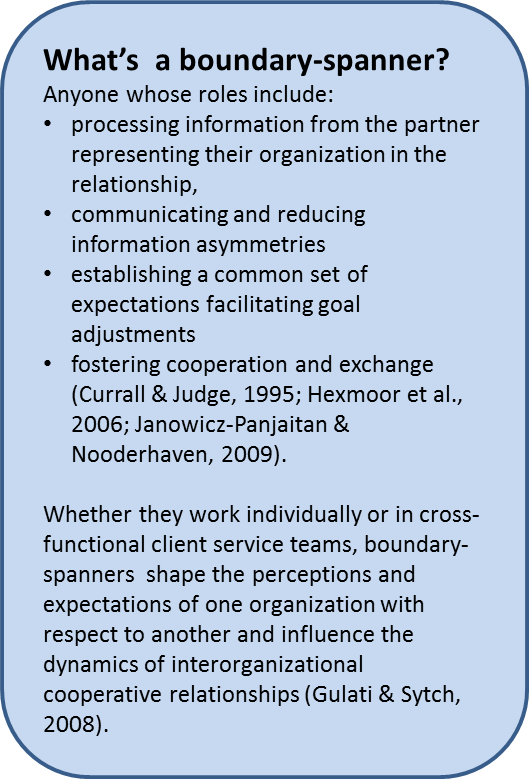 Increases willingness to collaborate on joint projects, to find synergistic ways to do business, to share tacit knowledge, and to achieve strategic outcomes (Fang et al., 2008; Janowicz-Panjaitan & Nooderhaven, 2009; Jap, 1999). Reinforces trust in the organization to create a virtuous cycle. “The more one trusts the supplier representative with whom one deals, the more one’s organization trusts the supplier organization…suggesting mutually reinforcing effects of trust at the two levels”(Zaheer, McEvily & Perrone, 1998, p.154). Conclusion: inter-personal trust matters. OK. What’s next? 2. Who’s the boundary-spanner and what matters to them when building trust? Now the answer becomes “it depends”. We tend to think of boundary spanners as the external-facing sales person, distributor, buyer, etc. but they can be in your legal department, in accounting, in your executive suite. Remember that inter-organizational trust is the collective trust held by the people in one organization with respect to another organization (Week 2). So it’s a combination of all the trust factors between all the people interacting in your organization with another partner –whether you’re a multi-national or a local not-for-profit. “strategic-level trust” occurs at the more senior levels of an organization where boundary-spanners are more likely to influence overall strategic direction of the organization. Here, trust is driven more by calculation due to the role’s focus on organizational objectives. Who are you dealing with and what matters to them? 3. What are other key factors for boundary-spanner trustworthiness or trust? reliability and benevolence (Jap, 1999; Hexmoor et al., 2006; Ring & Van de Ven, 1994). evenhandedness, predictability, trustworthiness and benevolence (Zaheer, McEvily & Perrone, 1998). “employees seasoned in more adversarial types of projects may be unable to shift to the cooperative mode necessary to make a project alliance successful” (Laan et al., 2011, p. 106). Boundary-spanning can be a tough job because it requires requires “constant mutual adaptation, interdependence, and joint action to create a relationship in which both parties feel high trust for the other” (Gullet et al., 2009, p. 330). 4. How does trust develop? “Trust and distrust increase in strength (depth) and breadth (bandwidth) as a function of the frequency, duration, and diversity of experiences that either affirm confidence in positive expectations (trust) or confidence in negative expectations (distrust)” (2006, p. 1005). However, and it’s a HUGE HOWEVER, there is an equally strong argument that trust between boundary-spanners stems primarily from institutional factors such as roles, rules, standards and procedures, counterpart’s skills, or trust in the partner organization etc. (Bachmann, 2006; Bachmann & Inkpen, 2011; Girmscheid & Brockmann, 2010). The length of past relationship as a key factor (antecedent) for inter-organizational trust is not universally accepted, nor is it empirically supported as a factor in determining future orientation (Ganesan, 1994), supplier choice (Doney & Cannon, 1997), or inter-organizational trust (Claro et al., 2003; Currall & Judge, 195; Gulati & Sytch, 2008; Johnston et al., 2004; Sako & Helper, 1998). In fact, two case studies from the strategic management literature found that, in the absence of preexisting institutions or history- when there’s no time to slowly build inter-personal and inter-organizational trust through repeated interactions – joint venture partners trusted the people and groups based on their expertise, signalling, etc. (see Week 7, Part C) (Girmscheid & Brockmann, 2010). Just as a plural governance structure – balance between formal and informal governance mechanims – holds the most promise for inter-organizational trust-building, inter-personal trust can be given quickly based on skills and governance factors. At the same time, the quality of the inter-personal relationship remains important. “The relational quality underlying the performance…is influenced by the behaviors of the representatives of the allying organizations” (Laan et al., 2011, p.104). 5. Is inter-personal trust the basis of most IORs? Is it sufficient? Exchange relationships must survive turnover or personality clashes (Sako & Helper,1998). Research has shown that there can be a 25-month delay between the beginning of an inter-personal relationship and an impact on inter-organizational trust (Gulati & Sytch,2008). Most organizations can’t afford to wait! Frequency of business contact has a positive effect on trust but social interaction is unrelated. In most business contexts the trustor places more importance on competence trust than goodwill trust (Doney & Cannon, 1997). There are “no significant relationships…between the trust scales and the length of time [boundary-spanners] had known each other in any personal or work related capacity. .. trust was impacted mainly by the interactions they had in the context of their roles…” (Currall & Judge, 1995,p.165). In other words, the “social stuff” has very little to do with building trust between organizations. Leaders may want to rethink their focus from wining and dining and focus more on presenting credentials, common goals, etc… There may also be a down-side to inter-personal relationships that are too close. For example, friendships and social ties may blur the lines of professional conduct and contribute to ethically questionable behaviour (Saini, 2010). Inter-personal boundary-spanning relationships have a limited role to play in attenuating the existing “break-down of macro-level trust in large organizations” (Bachmann & Inkpen, 2011). The root of the Twelve Weeks to Trust series is that there is an ton of available information on inter-personal trust but that will never be sufficient to reverse the worrying trends we are seeing in gobal trust in organizations, including NGOs, media and governments. It is my hope that by paying more attention to the macro drivers of inter-organizational trust we can focus on the big levers to enable organizations to trust each other more quickly and for better results.